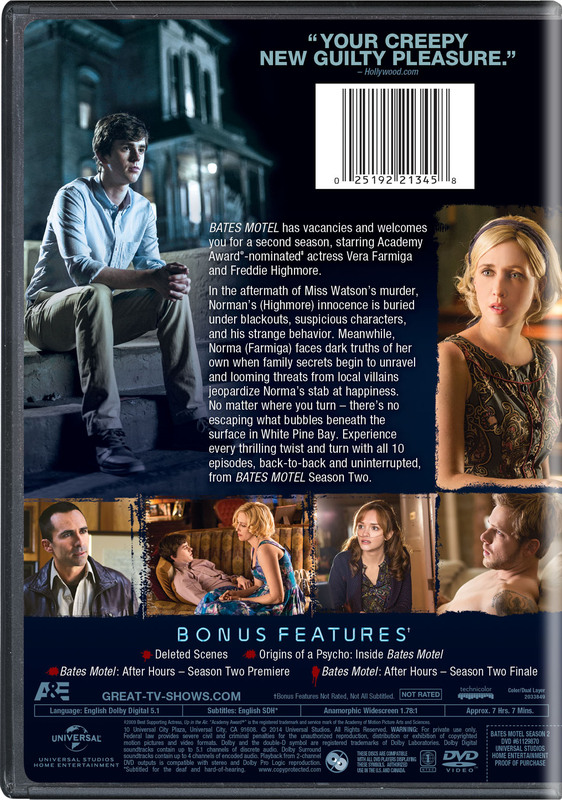 Bates Motel has vacancies and welcomes you for a second season, starring Academy Award® -nominated actress Vera Farmiga andFreddie Highmore. In the aftermath of Miss Watson's murder, Norman's (Highmore) innocence is buried under blackouts, suspicious characters, and his strangebehavior. Meanwhile, Norma (Farmiga) faces dark truths of her own when family secrets begin to unravel and looming threats from local villainsjeopardize Norma's stab at happiness. No matter where you turn – there's no escaping what bubbles beneath the surface in White Pine Bay.Experience every thrilling twist and turn with all 10 episodes, back-to-back and uninterrupted, from Bates Motel Season Two.